Home > Diplomacy > feature > Social > Sri Lanka > Who’s writing stuff for the EAM? Who’s writing stuff for the EAM? 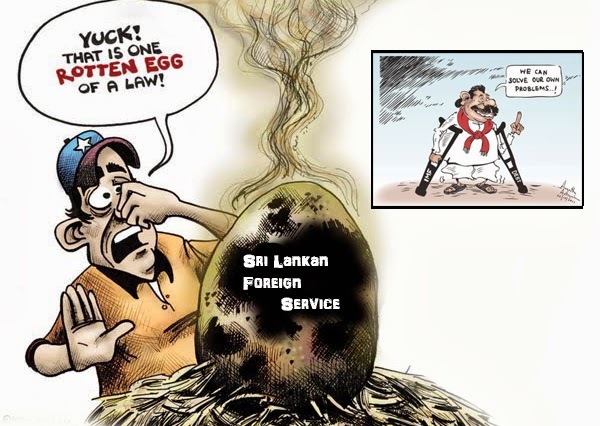 ( March 23, 2014, Colombo, Sri Lanka ) The statement of the Ministry of External Affairs on the release of rights activists Ruki Fernando and Father Praveen Mahesan caught international attention this week – for the wrong reasons. To begin with, the first sentence of the 97-word statement was no less than 57 words long and contained at least five clauses. Er, which action? There were already so many actions referred to in the preceding paragraph, including the fact that investigations are continuing! It was also impossible to gauge from the double-barrelled sentence what precisely the Government had done to demonstrate “the fair and transparent manner in which law and order is administered in this country”. The process evidently was not transparent enough for the EAM to know that neither activist was released “on bail” as it claimed. The statement compounded confusion surrounding the Government’s “fair and transparent” actions in relation to the arrest, detention, questioning and release of the men. People around the world took to twitter to ask whether they had, indeed, being let out on bail when it was already public that the discharge by the magistrate had been unconditional. Seriously, who drafts these things at the EAM these days?